Keith Warriner - Keith Warriner Ph.D.
Dr. Keith Warriner�s interest in food began at the age of fourteen with aspirations of becoming a chef. While attending the University of Nottingham in the Food Science Department, Dr. Warriner worked on how to improve water quality and the wash process. Food science is an innovative field with real world applications and this continues to propel Dr. Warriner�s interest in food safety. CPS staffer Connie Arana spoke with Dr. Warriner, now a professor at the University of Guelph, about his career path and his current research at CPS. What early experiences made you want to work in food safety? When I was fourteen I really wanted to be a chef, so I went to catering college and spent two years there. Then I attended Humberside College of Higher Education to study food science. The work that I completed at the University of Nottingham when I finished my PhD attracted me to food safety. Food science is an applied area and it is an area that makes a difference. Other sciences may be very intricate, but most of the time you do not really see the results of your research. It is published and kept on the shelf. With food safety there is a pressing need, a problem to solve. Once you have a solution to the problem more often than not the research results are applied. My interest on the fresh produce side started at the University of Nottingham in a totally different area. We were contacted by a company that was trying to improve its wash process. They were only getting a 1 log reduction and wanted to get more. That’s when we discovered from that small research project pathogens can internalize into plants. When you are in the fresh produce area you are aware of different initiatives. We knew about CPS fairly early on. There was publicity in terms of its creation as a result of the E. coli outbreaks in spinach. It is a unique center completely focused on fresh produce. CPS has funded “Enhancing the efficacy of fresh produce washing operations through establishing monitoring methods and water disinfection technologies based on a combination of filtration and UV.” What are the project objectives? Any updates? This project examines fresh produce contamination and how it is transferred from the field to the consumer. There are lots of studies that have shown when you inoculate E. coli and Salmonella onto a lettuce in the lab and wash it with a sanitizer you get a by-product of 5 log reduction. In a commercial operation you may have tons of leafy greens and the water quality will deteriorate. The objectives of this project are to examine water quality changes during typical processing operations. We want to know the certain degree for contamination. When there is contamination in the wash tank does it spread through the entire product or where does it go? We studied the contamination events, the factors associated with the wash process that actually affect the quality of the water, and how these can be monitored and controlled. We examined the conductivity of the water (a kind of solids content), pH, sanitizer concentration, temperature, microbial loading, and sanitation. The second part of the project is studying how wash water quality can be improved. We are looking at a process that is cheap and effective. We want to find alternatives, such as double filtration combined with UV which disinfects water, to maintain the water quality throughout the wash process. Those are the two parts of the study. We have completed year one and are just entering year two of the project now. We found out what really affects the wash process; although you might think it is the microbial loading affecting the washing process it really isn’t. We found that the efficacy of the washing (removing what is on the leafy green) is independent of the sanitizer concentration; independent from the microbial loading of the water; independent of the pH water as well. What was interesting is that there is better washing, up to a point, with high solids content. It seems counter-intuitive since you have soil, but it actually increases the wash efficacy. The temperature of the water is important. The key thing that affects the efficacy is the microbial loading of the leafy green before it enters the wash process. Having good quality of produce at the start is important to wash quality. Right now we are studying how to optimize the water recycling process. We are characterizing the solids content in the water because that tells us on the type of filtration medium required to clean up the water. The return to industry is fairly significant. Producers have two options: they can use the same wash water throughout the process or they can change the water every hour. The benefit of our research is to provide technology to industry that enables them to use wash water more efficiently by identifying the appropriate parameter to monitor the microbiological quality of the water. It has been estimated that a small to medium company could save $200,000 dollars a year by using water recycling as opposed to what they are doing now, dumping the water. If you extrapolate that to a large company the potential benefits to the industry are tremendous. We know what is going to happen with the Food Safety Modernization Act (FSMA) because that is really a five year template. We are going to see rigorous auditing. Through the auditing there will be increased surveillance and quality checking, which means increased cost. I think that the industry will get much more centralized, which can be a good thing and a bad thing. The bad thing is that it will reduce the number of small producers, but the good thing is that they will be able to implement food safety practices. In addition, I think we will see more high profile foodborne outbreaks in North America due to the aging population that are more susceptible to illness. This is happening in Europe and underlines the need to make food safety a priority. How was your experience attending the 2011 Symposium? At last year’s Symposium we did publish a poster, and for the June 27, 2012 Symposium I will be presenting my research progress. I really enjoyed this focused conference. I liked the opportunity to meet people in similar areas and discuss the issues. It is literally a roller coaster ride. Today, for example, I met a student to talk about a project. I sat in on an exam this morning as well. I’m going to go to a meeting with the Ontario Food Protection Association. A typical day essentially is speaking with students, exams, and lecturing. I teach three classes: Microbiology, Industrial Microbiology, and Food Management Systems, and have eight graduate students. What many academics find is they catch up with papers and report writing at night. I start at eight in the morning and go to bed at one in the morning. What are your interests and what do you do in your free time? I don’t really have down time. All of my interests are in fresh produce food safety, and I participate in a webinar series which gives information to the public. My interests involve microbiology and new technologies that arise. The only recreation I have is looking after my daughter. I get to do all of the things she does. Career highlights are sort of those eureka moments you get. I have had two. The first was the discovery of internalization of pathogens into plant tissue. Dr. Karl Matthews was doing similar work at that time. 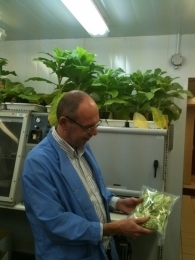 Also, the development of the UV decontamination method during sprout production, which is relevant today. This is a simple and cheap prevention method. It is still on the shelf in terms of commercial application, but we are hoping that will occur.